Ain’t no party like a star party, because a star party takes place far from human civilization, and you can’t play loud music or jump around because the vibrations could interfere with the telescopes and also you’re only allowed to use red lights so you don’t mess up anyone’s night vision while you’re stumbling around in the dark. Also, they’re usually freezing cold. Technically, they’re not all stock photos but hopefully people have a good sense of humor about it and see that it’s all in good fun, or else don’t see it at all. Tonight wasn’t feeling like a funny night but you can only do so many jokes about not feeling funny so we gave it the old college try and thought of something that was sort of like something funny but not really. Which then led to Googling “star party,” which brings us to that first stock photo. It’s crazy. He’s out there by himself and he can’t even look through the eyepiece. Clearly, it would be too much back strain. He climbed all the way up that mountain and spent an hour setting up his gear and all he can do is stand wistfully gazing at the cosmos with his naked eye, his $1000 functionally useless. After that, finding 3 more silly looking telescope pictures to caption took a matter of moments. Telescopes are inherently unwieldy, and from experience I note that that the people vested in carting them around tend to be fairly peculiar themselves. This entry was posted in 3D, photgraphy, photoshop, webcomic and tagged 3d, astronomers, captions, comic, funny, star party, stock photos, telescopes on March 10, 2016 by littledragonblue. Sometimes you have to land. This hummingbird lives in one of the aviaries at the Arizona Sonora Desert Museum; this picture was taken last Wednesday in the late afternoon. It’s cropped pretty closely and then I played with the color until it matched my mind’s eye a little more closely. The brightness is correct, but I’m afraid the color at the bird’s throat might not be. 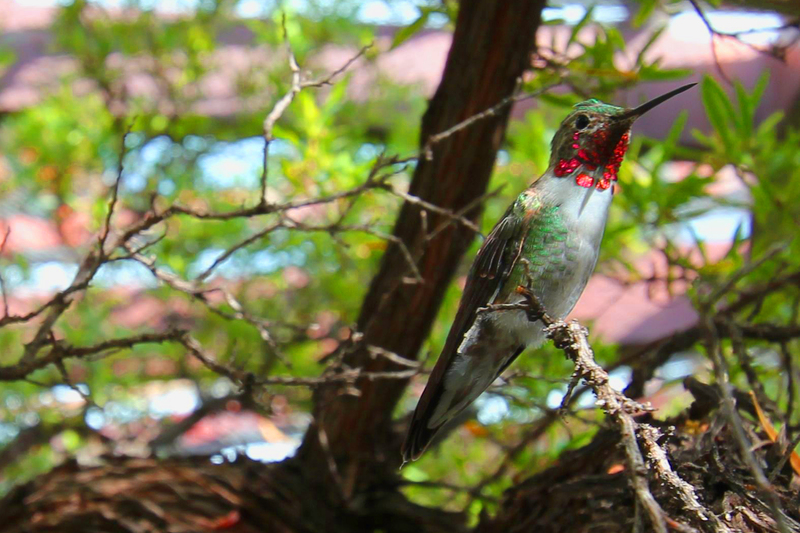 If this is, as I suspect, an Anna’s hummingbird, the tone should be more purple than red. Still can’t trust the camera. But the untouched image doesn’t come close to demonstrating the brilliant dazzle of a hummingbird in sunlight and this is a little more indicative. Like the hummingbird, I need to rest between flights. I have a couple more pictures like these, from that same day, which I’ll try to share this week, but I’m taking a little vacation from comics. They’re noisy in my brain and I need some space to think. I want to write a poem, and an article about comics, and finish at least 2 T-shirts, so it’s time to land for a few days. I think I’ll sit on the floor, with a notebook and a pen, and write. This entry was posted in photgraphy, photoshop and tagged beautiful, bird, colorful, hummingbird, nature, photoshop, update on October 20, 2015 by littledragonblue. You were probably expecting something with a little more depth, but that’s just a matter of perception. There’s a type of psychological intervention known as Sand Table Play Therapy, which basically involves arranging objects and figurines in a tray of sand. Sand is nice, but it also goes everywhere and I don’t really think it’s all that integral to the actual symbolic actions that comprise this treatment, which is basically about forcing rigid adult minds to become malleable enough to throw off the limitations of maturity engage in meaningful play. I’ve got a million of these little objects–I could easily have created dozens of different tableaux using stuff that’s already in my office–and it really is soothing to rearrange them sometimes. It’s also nice to justify owning all these tchotchkes. I’d been thinking about doing this type of 3-dimensional photographic comic for a long time, even before I started this blog. Reading Dave McKean’s Pictures That Tick made it seem like time to try. For some reason, I thought this would be faster than actually drawing a comic, which was not in any way the case. It took twice as long as Dragon Comics usually take. But it was more fun, and got me away from my desk. It would be really nice if there was some easy way to build a model that didn’t fully set: one whose features couldn’t be smushed, but whose arms and legs could be repositioned. And then I wish I had the equipment and knowledge to make stop motion animation films. Anyway, I wasn’t really ready to do a comic about my demons, even though creating them yesterday also inspired me to do this. Maybe one day. I’m still puzzling over my comic about depression. It’s funny: seems like everyone gets depressed, and yet depression is a really personal and idiosyncratic experience. At least mine is. 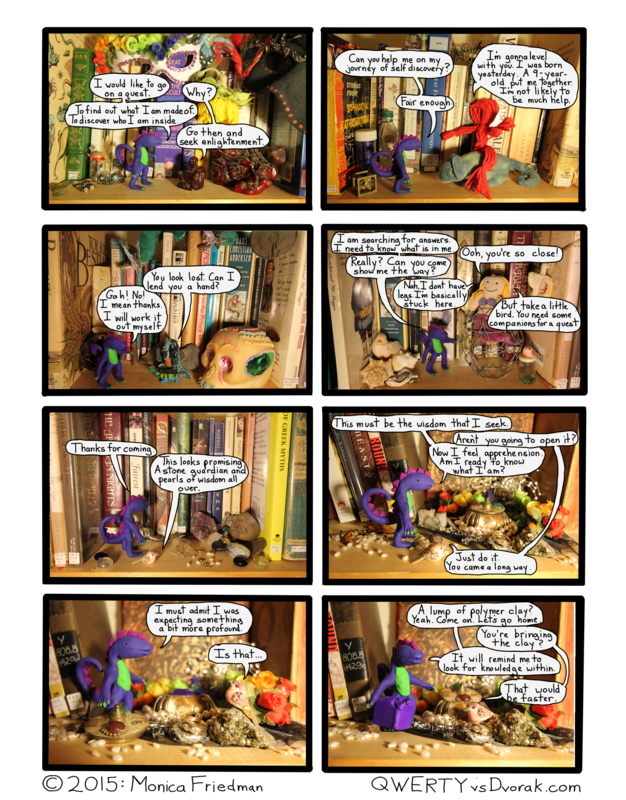 This entry was posted in 3D, comic, dragon comics, photoshop, webcomic and tagged bird, dragon, dragon comics, funny, knowledge, meta, photography, photoshop, quest, Sculpey, treasure, wisdom on August 28, 2015 by littledragonblue. I swear, storms are just bigger here. Further thoughts on Photoshop: I wear polarized lenses pretty much any time I’m outside during the day, and sometimes inside or at night. I’m rather attached to my prescription sunglasses for a variety of reasons. Of course, polarized lenses change the way the world looks: everything is crisper. Colors are more intense, details are more defined, outlines are sharper, and shading offers more definite contrast. Basically, the world looks better. In general. Of course, if you’re wearing polarized lenses and you use them to look through another polarized piece of glass, you get another effect. Sharper, still, in a sense, but overwhelmed with colors that simply aren’t there if you remove one of the pieces of glasses. It’s not the face of reality, and yet it’s what you see, if, for example, you wear polarized sunglasses in a car. We went to see our friends in Bisbee over the holiday weekend, which coincided with the actual start of the monsoon–that is, the first big storm. 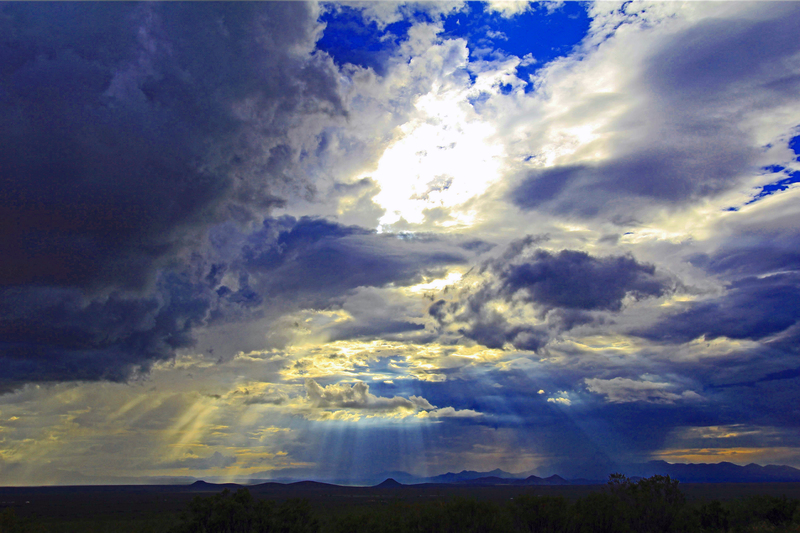 The clouds were still hanging heavily in the sky, and distant showers dotted the horizon, as we headed back to Tucson. Even the best pictures often fail to capture the majesty of something like this: the sun streaming down through breaks in the clouds, illuminating the lines of rain sweeping diagonally across the desert. I start with a nice image, and tinker with it, trying to light up the most stunning parts so that the flat image matches the glory of memory. I haven’t quite hit it yet. When I was little I liked to imagine that the beams of light piercing the clouds had something to do with the proximity of heaven to the earth, even though I knew it was just sunlight. There’s something special about the big sky, about towering cumulonimbi, about light that takes on, for a short time, in an illusory capacity, the quality of a solid object. When you block out part of it, maybe, you can see a greater part of the reality of that which remains. I fully intended to publish a comic, or at least a drawing tonight, but The Man sometimes gets really excited about particular movies or shows. Right now it’s the Netflix original series Sens8, which is pretty good, but I don’t know if it’s worth him staying up 90 minutes past his bedtime every night. I didn’t even get to work until almost midnight tonight. At least we’ve only got maybe 2 more nights’ worth of this season, so hopefully both of us will be better equipped to work by the end of the week. This entry was posted in photoshop and tagged clouds, color, photoshop, rainbow, sky, storm, wacom tablet on July 7, 2015 by littledragonblue.